Your paddle needs to be right if you want to get the most out of your paddling and there is more to it than you might think. 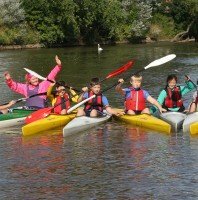 Although there are similarities we have given canoe paddles and kayak paddles their own separate pages as there is plenty to learn about each. We can start with some general principles that apply to both. The most important factor about your paddle is its size. Let me repeat that just in case you didn't get it first time or you were skim reading! 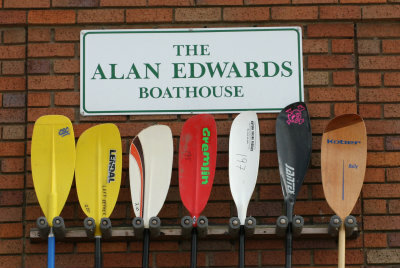 The most important factor in choosing your paddle is its size. And on top of that there are two aspects to getting the size right. One is the overall length of paddle blade and shaft and the other is the size of the blade. This is true whatever boat you plan on paddling. If you were paying attention at school you may recall that you can exert more force with a long lever than a short lever and your paddle is a lever. So it follows that you can exert more force with a longer paddler. The trouble is having a longer lever does not make you any stronger and if your paddle is too long the force you need to exert to move the blade through the water in the most efficient and effective way will be greater than the force your body can muster. Instead your body will compensate by letting the blade move through the water in a way that exerts less force and is less efficient. Every stroke will feel extremely hard and you will soon tire. 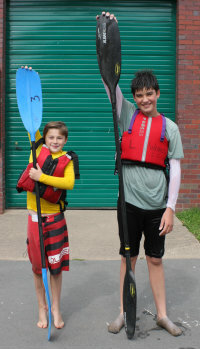 Likewise if your paddle is too short you won't be able to apply as much force as you'd like and you will be whizzing your arms around really fast without getting very far. We'll show you how to choose the right length of paddle for your build and for the type of paddling you want to do on separate canoe and kayak pages. As well as overall length blade size affects the amount of force you can exert. The bigger the blade the more force you can apply. In less stable boats your blade is also a key means of support if the blade is too small you will feel less stable than if it is the right size. 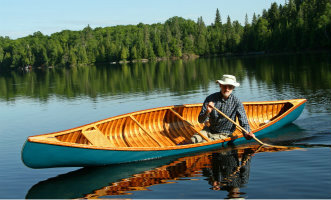 Again we will look in more detail at blade size on the specific kayak and canoe pages. The basic shaft is just a straight tube, however some paddlers prefer an oval shape which helps the paddler to know what angle they are holding the blade at (very useful when upside down and preparing to roll back up!). Wooden shafts can be made in an oval shape whilst round aluminium or composite shafts can be ovaled by the addition of a plastic insert which is fixed to the shaft under a layer of special "shrink to fit" plastic. It's a more elegant solution than it sounds! Some shafts are also fatter than others and a slimmer shaft will definitely be more comfortable for those with medium to small hands. Finally there is the weirdly shaped cranked or bent shaft favoured by a small number of paddlers. The aim of these paddles is to change the way the wrist sits and is able to extend on the shaft. Some people find that they alleviate repetative strain injuries on the wrist and other people just find them a really comfortable shape for paddling. The most basic blade shape is a rectangle with some degree of rounding tapered at one end to fit into the shaft. Some then have a scooped profile. Then there are asymmetric blade shapes in both flats and wings. The distance cruiser, sea paddler and racer would typically chose an asymmetric paddle whilst whitewater paddlers, surfers, slalom paddlers, polo players and canoe paddlers would all be seen with a more rectangular shaped blade. Flats are traditional paddles that the man in the street would expect to see. We then have the less familiar "wing" paddles. These have a curled edge to grip the water and provide an element of lift in the same way that an aeroplane wing does. Again there are a range of wing shapes. Wings are extensively used by racing paddlers and are not used by canoes. 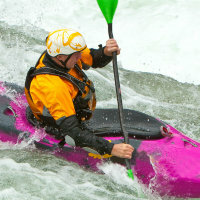 More on these on the kayak paddles page. Your paddle blade will almost certainly be made out of either polypropylene, a kevlar/ carbon / fibreglass composite or wood whilst the shaft may be made of aluminium, composite or wood. Introductory paddles tend to use aluminium shafts and polypropylene blades as they are relatively cheap and hard wearing. When you make the switch to either wood or composite it will be like taking your big clumpy slightly oversized wellies off and putting on some really comfortable light weight running shoes. For the more serious paddlers wood remains fairly popular for canoe paddles but by far the most popular kayak paddles are those made of kevlar / carbon / fibreglass composites. Both of these materials provide a lighter, more responsive feel and are warmer on the hands in cold weather than an aluminium shaft. Composite materials have the advantage of being made as individual components of shaft and blade which can be fitted together to suit the individual paddler. 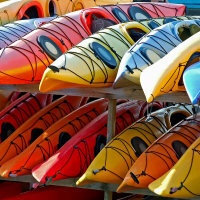 With canoe blades this is less of an issue but is a major advantage with kayak paddles.